Chronic Pain, so many of us feel like this suffering is endless. You may have tried every pain reliever, physical exercise, and not found the relief. Join our special guest, Lama Jigme Gyatso as he connects us with other possibilities of finding relief from this physical imbalance. 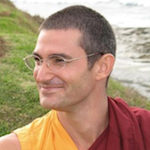 Hosts: Christina Souza Ma with special guest Lama Jigme Gyatso airing on Wednesdays @ 11am PT (2pm ET).